Bhateri Devi, 66, wanted to be a mother all her life. And now she finally is - three times over. 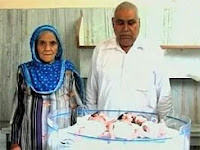 Devi, who is now thought to hold the title for the oldest mother of triplets in the world, gave birth recently after undergoing in vitro fertilization treatments at a well-known fertility center in India. How soon Devi and her husband of 44 years will be able to take their children home is yet to be determined. The health of the two boys and one girl remains precarious. At only 1.077 kilograms, 1.02 kilograms and 0.651 kilograms, they are seriously underweight and are being monitored in the intensive care unit of the National Fertility Center in the Indian state of Haryana. Deva Singh, her husband, is delighted nevertheless. "Bhateri has fulfilled my dream of having a child and gave my family an heir," he said. "She was my first wife and after she failed to conceive a child, I married twice but again I did not have any child from my other wives also." Originally posted in July 19, 2010.